May 26, 2016 — San Francisco — Gallery Wendi Norris is pleased to announce Christine Elfman’s second solo exhibition, Even Amaranth. With this new body of work, Elfman continues her exploration of photography’s defining features as a medium, both its capacity to capture a subject and its corresponding fugitivity. Even Amaranth—titled after the flower called “unfading” by the Greeks and associated with Diana, the goddess of the hunt and fertility—will feature a selection of images that represent this central tension both in theme and substance. Through landscapes, photograms and anthotypes, Elfman reveals the elusive character of the subject in photography and the fleeting, fraught relationship between viewer and the viewed. In preparation for this exhibition, Elfman grew amaranth from seed in order to make photographs from its juice. She exposed images of marble statues and plaster casts of sculpture, using this liquid as a photographic emulsion. Capable of producing a deep red and tonal variations of orange and brown, the amaranth coating transforms over time. For Elfman, this changes the subject of the image into a meditation on the viewer’s desire for it. 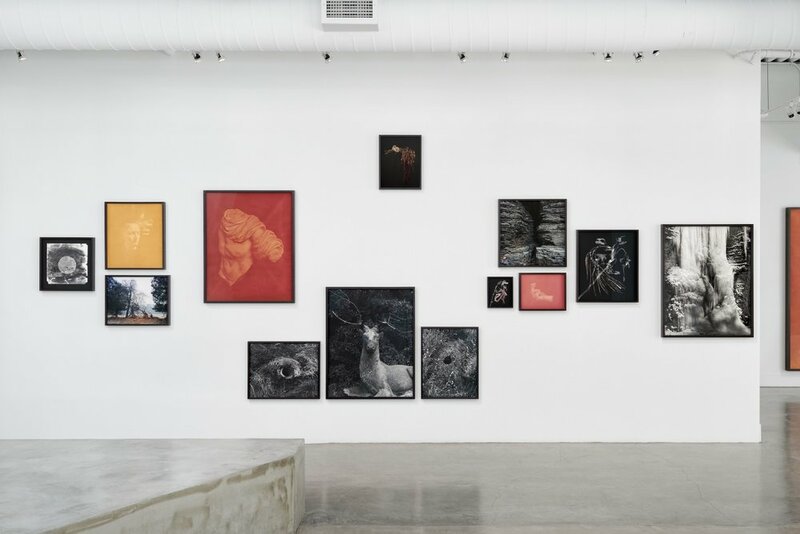 The theme becomes the challenge of photography itself, which she compares—more generally—with the task of viewership: the more one tries to capture or “hunt” an object, the more it evades our grasp. Elfman pairs these amaranth on paper images with silver gelatin and pigment prints of landscapes where the trace of human presence is now long absent, as if to suggest a fragmented narrative in which figure is unique from setting. Hollow Horn features a hunter’s tree stand covered in vines, Mortar shows a deserted Indigenous American mortar formed through countless years of grinding stone, while Ash and Eldorado suggest the scene of a crime. Together, the pictures leave us to consider photography’s registration of the trace as part of a larger, unstable project of memory. This series, at least in the examples tracked by Elfman—from the reproduction of statues to the proliferation of mythology—has a longer history of mediation between ideals of the faithful copy and free transformation.